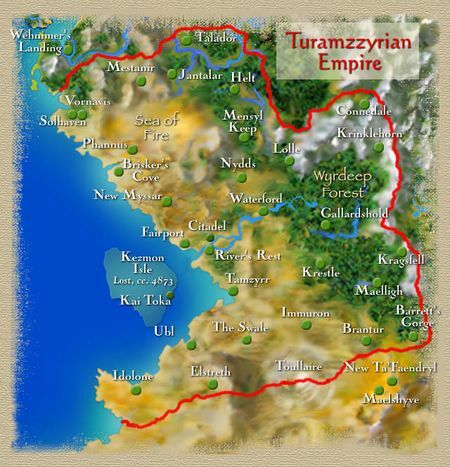 The Turamzzyrian Empire is a human empire which controls much of the land to the west of the Dragonspine Mountains. The capital city is Tamzyrr in the Duchy of Selanthia and its present ruler is Emperor Aurmont Chandrennin Anodheles. The empire extends as far north as Talador and as far south as the Aldoran capital of Elstreth and the Estorian city of Idolone. The small trading town of Wehnimer's Landing is not under the control of the empire, despite recent attempts to do so by the former Baron of Jantalar. Vornavis and Solhaven are the two largest cities in the northwest region of the Empire. By the end of the fourth millenium of the Modern Era, the Kannalan Empire had collapsed, and western Elanith dissolved into small independent provinces and city-states. Several successor states arose in the years that followed: the Kingdom of Torre around Fairport and Maelstrom Bay, the Kingdom of Hendor around Lolle and Waterford in the north, and the Turamzzyrian Empire around the southern port city of Tamzyrr. 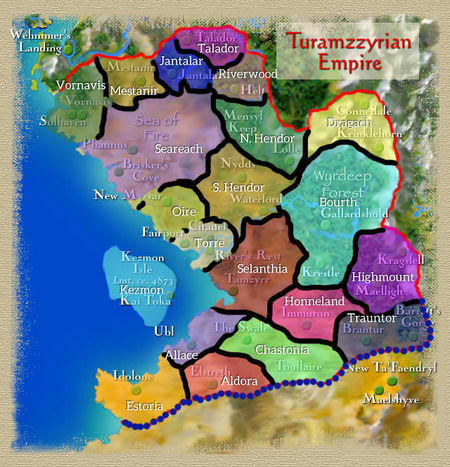 The Turamzyrrian state began as a trading alliance between the cities of Tamzyrr, Elstreth, and Kai Toka. Selantha Anodheles, Overlord of Tamzyrr, united the three cities from 4273 to 4278 and was coronated as the first Empress of the Turamzzyrian Empire. Under Selantha's rule, the Empire began a more than 800 year long period of expansion. Selantha reigned until her death in 4302, having brought the former Kannalan regions of Bourth, Honneland, and Toullaire under imperial control. However, neither Selantha nor her immediate successors were able to defeat the Kingdom of Hendor. The rule of the House of Anodheles ended in 4309, when the young Emperor Veridel was deposed by regent Chaston Kestrel. Emperor Chaston Kestrel signed a treaty of peace with Hendoran King Thurbon II in 4312. Under Chaston Kestrel's rule, the empire underwent a great racial change in which many non-humans, particularly those of elven heritage, were motivated to emmigrate out of the empire after the declaration of Chaston's Edict. The Empire began an expansion eastwards towards the Dragonspine Mountains under Chaston's rule to the region presently known as the Barony of Highmount and established the Imperial outpost of Kragsfell. It was also under Chaston's rule that the Imperial Navy was expanded and improved to become the dominant naval force in the Great Western Sea. In 4327, Mount Ysspethos, a volcano close to Tamzyrr, erupted and Chaston and his immediate heirs were wiped out. His successor was Immuros Kestrel. Rather than focus on the expansion of the Empire, Immuros dedicated much of his reign to infrastructure development and supported road building and irrigation projects through out the empire. Tamzyrr was rebuilt and in addition, Immuros began construction on Immuron, a city built on the ruins of Gor'nustre. As a side result to Immuros' focus on matters within the empire at the expense of expansion, the Imperial Army at the time shrank in size. Perhaps the most important event of Immuros' rule was the establishment of the Hall of Mages, as a magical academy for the empire. The Hall of Mages has since become the leading producer of magical users in the Empire in the present day. Immuros died in 4375 and was succeeded by Celeste Kestrel. Her rule was challenged by her brothers and the Empire descended into a brief civil war. Celeste emerged victorious only to drown when the imperial barge sank in 4402. This was the last time a Kestrel ruled the empire. By deft maneuvering, the Burzost family successfully claimed the Sun Throne. The rule of the Burzosts was one of little accomplishment other than the annex of the County of Torre in 4417 under Jasdurel Burzost. Under the same ruler, the Barony of Highmount was overrun by giantmen of the T'Kirem Bear Clan. However, by the death of the last of the Burzost, the giantmen had successfully been driven back into the Dragonspine and the Empire's control over Highmount permanently ensured. Upon the death of Jasdurel's heirs, which numbered in three successive short reigns, Levian Chandrennin assumed control of the throne to the Empire in 4402. The first of the Chandrennin to do so, the family from this point ruled the Empire for more than two hundred years. History flowed without great interruption in the Empire up until 4565, when in the reign of Verranna Chandrennin Toullaire was annihilated in a magical explosion that was believed to be the result of reckless experimentation by the Arcanum, a rival magical school to the Hall of Mages. As a result, Verranna ruled that the Hall of Mages to have a virtual monopoly on magical teachings in the Empire. Also placed in effect was mandatory registration of all magic users in the Empire. From this point on, the Kestrel family consolidated their control over magic in the empire. A decade later, Emperor Krellove Chandrennin initiated the First Elven War against the House of Nalfein in 4605. The Empire was victorious and its armies, led by General Vaycero, Lord of Idolone, took control of previously neutral territory on the Turamzzyrian-Nalfein frontier. The war ended with the death of Krellove in 4610 and the construction of a fort at Barrett's Gorge two years earlier. Krellove was succeeded by Toscus the Fat. Toscus immediately buried any plans to re-start the war and ruled until 4622, when he was assassinated for secretly plotting with the Nalfein. The neighboring human Kingdom of Hendor fell to orcs in the Witch Winter of 4628 to 4632. Over the next two decades, Turamzzyrian armies gradually retook the former Hendorian lands, including Lolle, Waterford, Nydds, and Mensyl Pass. Resettlement of Hendor led to a shift in power away from the House of Chandrennin, with other imperial houses and former Hendorian nobility clamoring for more freedoms. In 4686, Emperor Baeronnar II abdicated and Perrinor Rysus was crowned as the new emperor. Under Perrinor, the Rysus Codex was established as the new legal foundation of the empire, with power distributed to the aristocracy in a feudal system. The death of Emperor Feadros Rysus in 4715 led to a three-year war of succession. Several claimants were assassinated during the course of the war, and in the end most of the nobility threw their support to Lyssandra Anodheles. Her initially shaky rule was strengthened with the formal support of the Church of Koar, and the next few decades saw great increases in the church's power and political influence. In 4679, at the behest of the Prelate Fzendoor of Immuron, Emperor Rallick marched against the House of Nalfein to the east in the Second Elven War. They were forced to retreat and sign a peace treaty following the death of Rallick in battle. In 4800, Emperor Ommindar moved to curb the Church of Koar's influence, ensuring that the church's Patriarch would henceforth be personally appointed by the emperor. In 4841, Empress Selantha II invaded the dark elven House of Faendryl in the Third Elven War. Despite initial successes, the Turamzzyrian army was routed by a horde of summoned demons at the battle known as The Breaking. Imperial remnants under Duke Nyrmont of Kezmon held the demons' advance for a time but were ultimately forced to retreat back to Barrett's Gorge, and the war ended without a formal treaty. With demonic fiends still loose at the border, the Demonwall was constructed and fortified over the next several decades. The Horned Cabal, a group of five liches, appeared as a major threat in the south in 4953. With imperial forces unable to destroy the undead menace, the formerly minor Order of Voln saw increasing membership in the following decades. The Cabal was finally defeated in 5074 during a great battle between imperial and undead armies when a small band of Voln monks was able to slip past the main forces and slay one of the five members of the Cabal. The remaining four members fled into the wastes. In 5092, amid a swelling of Turamzzyrian pride, Empress Mynal'lyanna revived Chaston's Edict, reestablishing many of the old restrictions on non-humans, and cast the sights of the Empire on outside lands once more. These expansionist policies have largely continued into the present day under her successor Aurmont. From at least 4718 M.E. to 5106, the symbol of the Turamzzyrian Empire was a golden sunburst, which was the symbol of the house of the Anodheles, who controlled the imperial throne in that time period. It is unknown if the golden sunburst was a legacy of Selantha's initial reign or if it was brought back when the Anodheles regained the throne. Under Chaston's Edict, non-humans are forbidden from owning land or businesses. The edict is more strictly enforced in the southern provinces, being nearer to both Tamzyrr and the elven-controlled lands to the east in Ta'Nalfein and south in Ta'Faendryl. Many elves who once lived in the empire have fled into Wyrdeep Forest. The policy extends as well to dwarves, gnomes, and the occasional orc, half-orc, or half-krolvin, collectively known as ordlyn. Half-elves, or hathlyn, are permitted more freedoms, and a few northern barons are known to have elven heritage. Within the empire, all elves are known as sylvan, but the reasons for this have been long forgotten, at least by the human population. There has never been any known contact between the empire and the sylvankind of Yuriqen. This page was last modified on 1 August 2017, at 19:45.